Immerse yourself in what you do, lose yourself to Life, then your entire living experience is a prayer! 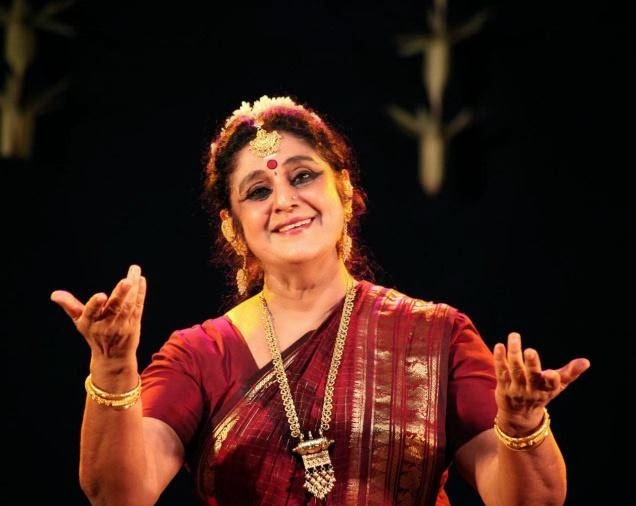 Later this evening, the eminent dancer Chitra Visveswaran is set to be honored, by The Music Academy, with the title ‘Natya Kala Acharya’. This morning’s Hindu runs a beautiful profile of Chitra akka (as she is fondly called) written by her close friend and art lover Hema Iyer Ramani. The profile is titled, “Journey of Challenges”. I have had the opportunity to observe Chitra akka, from a distance, in the past decade or so. I am aware of some of the challenges she has faced as a person. But I have always admired her resilience. And have often found myself inspired by her ability to be grounded (despite all the adulation she receives), to be calm (despite all the chaos around her) and to always be giving – of her time, her understanding to others at one level, and of herself, to her art form, dance, at another level! I remember an experience – and learning – I had, some years ago, when Visveswaran, Chitra akka’shusband, passed away. Just as in her name, I could never think of Chitra akka in singular. To me, she and Visvesh (who was an accomplished singer apart from being a ‘Santoor’ expert) were a couple, always together – in their music, in their dance, in social dos and in their inspirations. It was unfathomable to think of them as separate. As Hema points out in her profile this morning, “When ‘Santoor’ maestro Pandit Shivkumar Sharma asked him (Vishvesh) to give up all else to the exclusion of ‘Santoor’, he said he could give up all else except singing for his wife and composing music for her productions!” So, when Visvesh died, at least I expected Chitra akka to be in mourning for a very long time. But within 10 days of Visvesh’s passing, Chitra akka convened an event at the Bharatiya Vidya Bhavan in Chennai to “celebrate” Visvesh’s Life. It was a memorial service with a difference. There was no mourning. There were no grief-stricken speeches. Visvesh’s own guru, Pandit Shivkumar Sharma too spoke, oozing joy, as if he was holding a toast to honor his student! And then Chitra akkaherself spoke. She said (I recall vividly), “I only see Visvesh as not being here physically. But his presence will always be with us, with me. He taught me to live this Life as if it were a prayer. As if it were an offering to the Universe. Which is why we both enjoyed each other’s companionship and the work we did together. To me my Life, my work, is not something which has to be ‘gone through’. It is a prayer.” She then performed a dance piece, accompanied by Visvesh’s song recording, that left all of us in the audience in a trance! I have, ever since, held that learning from Chitra akka close to my heart. I have discovered that when we immerse ourselves in what we enjoy doing then it ceases to be work. It becomes our Life. Then no loss nor any challenge can pin us down for too long. Then our individual energy, the one within us, resonates with the Universe’s energy. In that beautiful communion, an inner peace, a rare joy, takes over. And our entire Life becomes a celebration, a prayer, an offering to this Universe! Author AVIS ViswanathanPosted on January 3, 2014 March 14, 2016 Categories Art of Living, Chitra Visveswaran, Chitra Visweswaran, http://schemas.google.com/blogger/2008/kind#post, Inner Peace, Intelligent Living, Music Academy, Pandit Shivkumar Sharma, Prayer, Santoor, Visvesh2 Comments on When Life becomes prayer…!